© This annotated Ordnance Survey 1:500 Town Plan of 1894 is reproduced with acknowledgement to Neil Lawrence. The image above is taken from a collection of whole-plate negatives. The photos were probably taken around the 1920s. If you recognise this street, please email me. Thank you to John Hadden for annotating a copy of an 1891 Bartholemew map to show where he believes that the photo above might have been taken from. John's annotated map is the first of the two maps reproduced below the photograph at the top of this page. "I didn't expect to find any more answers as there are not very many clues in some of the photos. However, Photo 11 looks like the remains of a demolished building in the left foreground, and there had been a covered entrance under the far end of that building. I'd noticed that most other entrances were in the middle of straight lengths of building but the opening on this one would have placed it in a corner, ie with a wall perpendicular on one side, making it slightly unusual and therefore hopefully more easily spotted on a street plan? 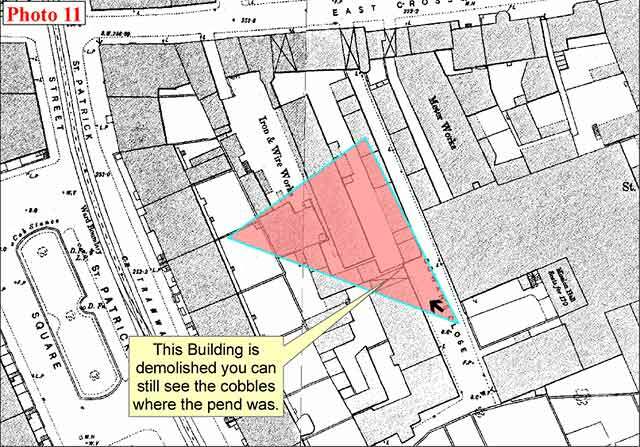 Referring to the 1890s street plan, there is one place where I can see an entrance arrangement as above and the demolished building is still shown, in Cowan's Close. This photo could be taken looking towards the NW. Just out of sight off the right of the photo would be a view towards the entrance to Cowan's Close, off East Crosscauseway. 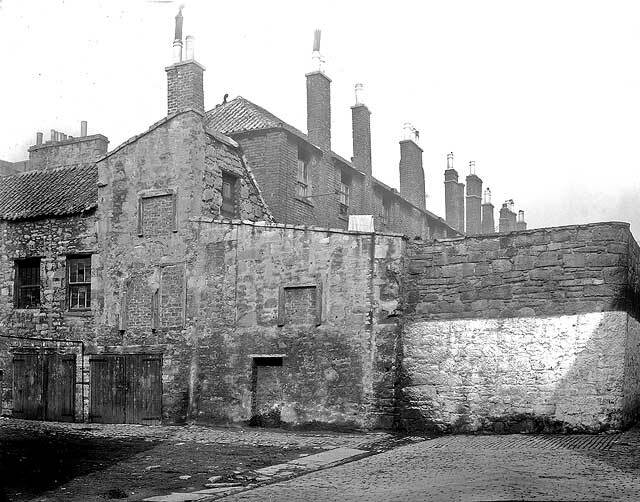 The tall brick building in the background would be parallel to and between Cowan's Close and Clerk Street. I'm pleased to see a small glimpse into this street, as it's where my great grandfather (Thomas Wallace) lived in 1878. The street is so different now. Thank you to Neil Lawrence for annotating a copy of his 1:500 Ordnance Survey Town Plan of Edinburgh, 1894, to show where the photograph above would have been taken from. Neil's annotated map is the second of the two maps reproduced below the photograph at the top of this page. Neil's conclusions agree with John's conclusions in 'Reply 1' above. Both the maps above were annotated independently. I received the map from Neil before I had added the John's map above to the web site. Acknowledgement: Neil Lawrence, Fountainbridge, Edinburgh: July 15, 2008. 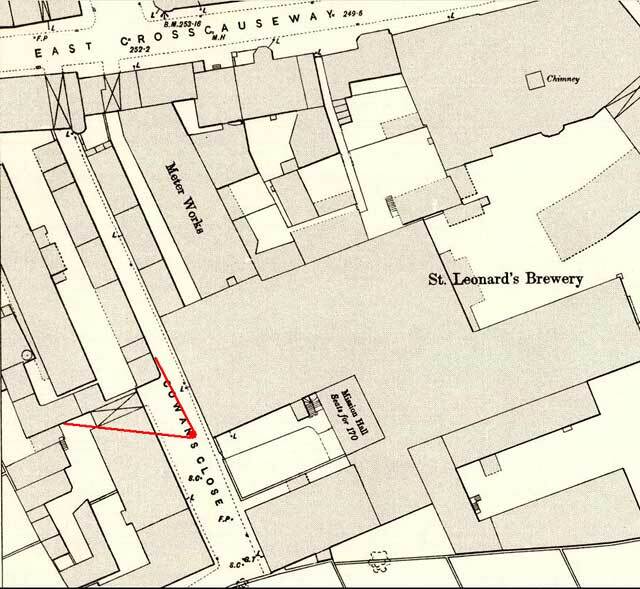 Cowan's Close can be seen at the extreme left of the St Leonard's map below, about 1/3 of the way down the map. More photos - Questions and Answers: Where is it?